Dill is native to the eastern Mediterranean region and western Asia. 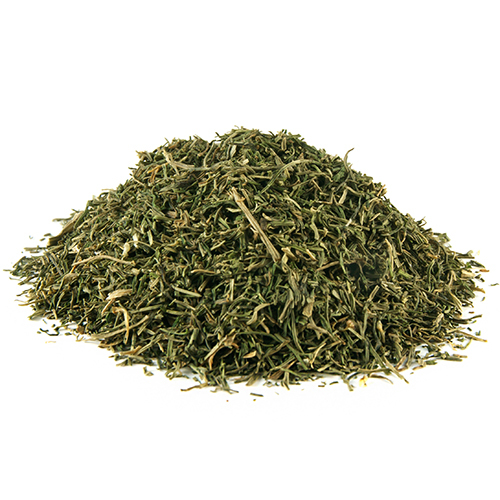 Dill is an aromatic herb with delicate, feathery green leaves, sometimes referred to as dill weed. Dill is a member of the parsley family. The flavor of dill weed resembles the licorice-like flavor of mild caraway or fennel, the plant is, in fact, often mistaken for fennel fronds. The herb, especially when fresh, has a much sweeter fragrance than its dried fruits. Dill leaves have a wonderful aroma, a fantastic flavor and most importantly it looks great in dishes. Dill weed naturally brings to mind pickles. Beyond its use as a pickling spice, dill weed has a natural affinity for zucchini and summer squash, asparagus, and spinach. It complements cold-water fish such as herring and salmon and makes a notable appearance in recipes for borscht. Add fresh dill weed at the end of cooking to preserve its flavor and color. Dill cultivation requires warm to hot summers with high sunshine levels; even partial shade will reduce its yield substantially. You can harvest dill weed once the fern-like leaves develop (about 8 weeks), though experts recommend not harvesting any more than 1/3 of the plant at one time. While pruning dill does encourage new leaf growth it ultimately shortens the lifespan of the plant.